Prior to the start of this season, the WHL brought in a rule involving pucks that go into nets off skates. According to the WHL, “Unless the puck is in the goal crease, a puck that enters the net off a player's skate shall be ruled a goal. This will eliminate the need for a decision by the referee and/or video goal judge as to whether it was a distinct kicking motion or not.” The new rule came into play on Friday in Calgary during a game between the Hitmen and Kootenay Ice.The Ice led 2-1 when Calgary F Tyler Mrkonjic scored at 1:18 of the third period. Eventually, the game went into OT. Calgary F Mark Kastelic thought he had won the game with 29.3 seconds left in OT.From the WHL web site:“In the overtime period, the Hitmen were able to jam a puck past Ice goaltender Payton Lee during a goal-mouth scramble. Igniting the red light, Calgary emptied from its bench, celebrating what appeared to be a victory. Meanwhile, Lee protested and his teammates headed down the hallway to the dressing room.“Across the ice at the timekeeper’s box, on-ice officials were on the phone with video review and quickly overturned the goal, bringing both teams back to the ice.”So . . . what happened?According to a tweet from Brad Curle, the radio voice of the Hitmen, “Video review showed the puck was kicked in. New rule only allows a kick outside the blue crease. He was in the crease.”Eventually, F Taylor Sanheim’s shootout goal gave Calgary a 3-2 victory.——The Medicine Hat Tigers are into their second season in the Canalta Centre, but they still aren’t in what is supposed to be a $1.5-million dressing room. In fact, construction on that dressing room hasn’t even started. . . . Ryan McCracken of the Medicine Hat News has more right here.——As part of their 50th anniversary celebrations, the Brandon Wheat Kings and the Brandon Sun are asking fans to help pick the franchise’s Dream Team — the top 20 players in franchise history.The online project allows fans to select two goaltenders, six defencemen and 12 forwards from a list of 50 that is provided. 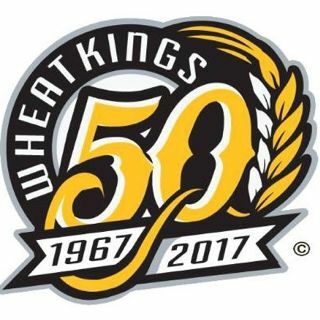 Voting is to begin on Monday at wheatkings.com. Swift Current at Saskatoon, 2:05 p.m.